DIY: While not badly priced, these earrings can still be made for less. Simply fold over some leather (or pleather) over a hoop earring or circular piece of wire. Glue the fold in place and snip the leather into fringe. Attach chain to the hoop and bring in a charm. 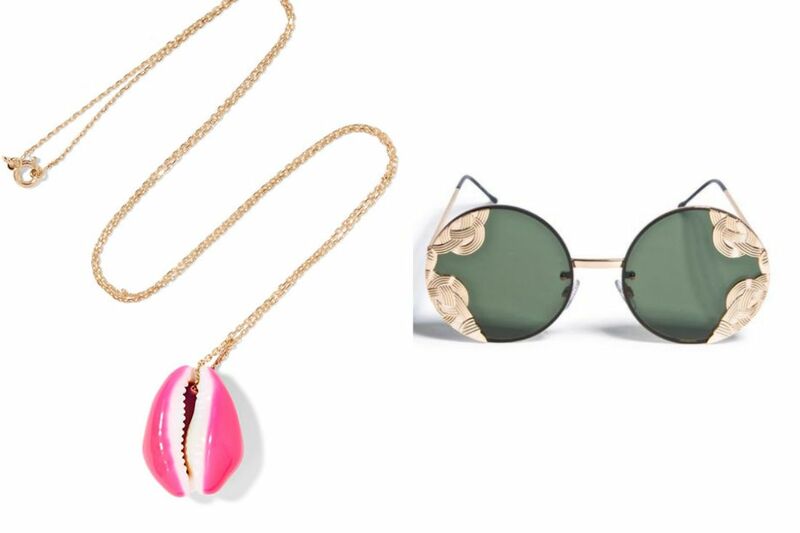 DIY: Paint a cowl shell bead neon and slip it on a chain. Easy peasy. Sure, it might not be 18-karat gold… but who cares?! DIY: Sunglasses projects are some of my favorites. This one can be replicated by adhering metal stampings directly to some basic shades. You can metal stampings on Etsy or in the scrapbook section of your craft store. Looking for more ideas? Check out past “DIY Inspiration“ posts for more crafty goodness.